FeastHome – Are you getting bored with a neutral-colored kitchen or pastel-colored kitchen? Then, you can try an orange-colored kitchen for a colorful kitchen in your house. 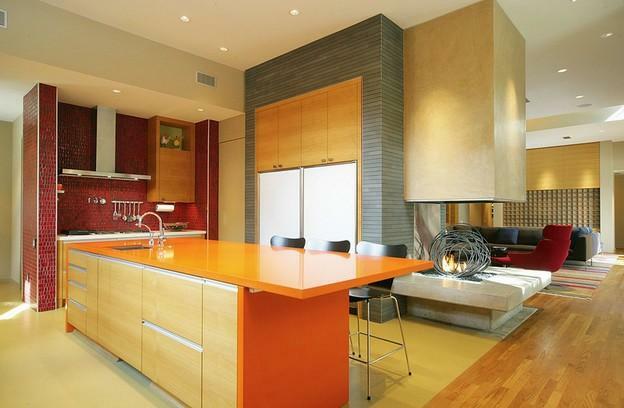 The orange color is able to make your kitchen area looks fresh. There are many tones of orange so that you do not have to be worried about your kitchen will look too flashy. 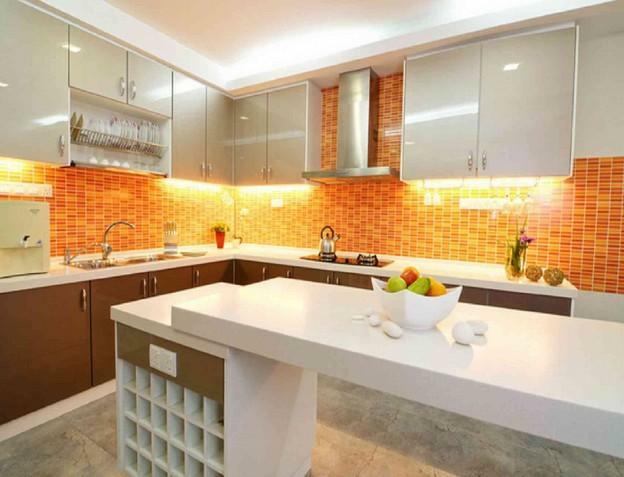 Here are some ideas of an orange color kitchen which can be your inspirations to have a colorful kitchen. This kitchen area is pretty small so that an L-shaped kitchen is chosen in order to maximize the space. The orange color is applied to the kitchen cabinets and also a little part of the kitchen wall. 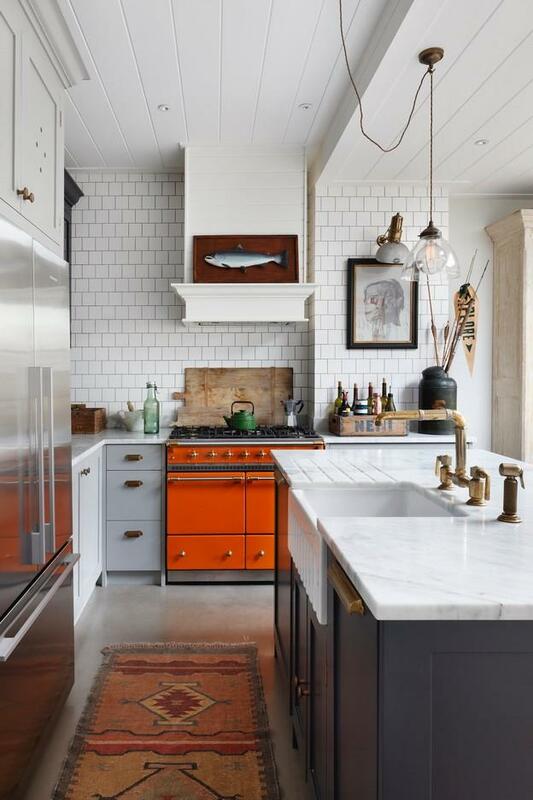 Actually, this kitchen is lack of pattern and decoration, but the orange color is able to add a color and make the kitchen area looks fresh and less boring. 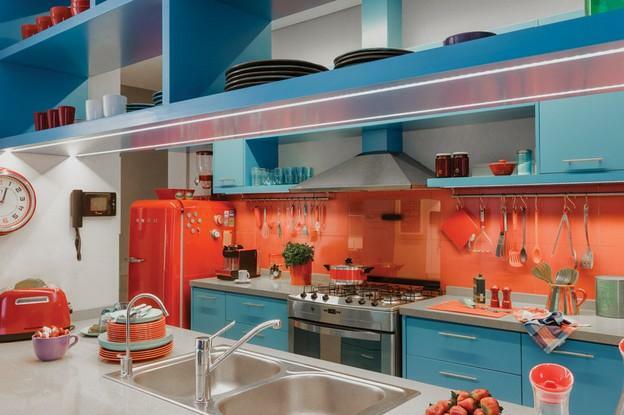 A neon lamp is installed at the bottom of the orange kitchen cabinet in order to add brightness to the area. The householders pick a light tone of orange which blends prettily with the red kitchen wall and wooden kitchen cabinet. The cooking area is privately placed in one side of the kitchen area, creating a private place for the householders to freely cook the meals. The pattern of the red kitchen wall brings a pattern that makes the area looks more attractive. And the householders use the grey kitchen wall as a partition between the kitchen area and family room. 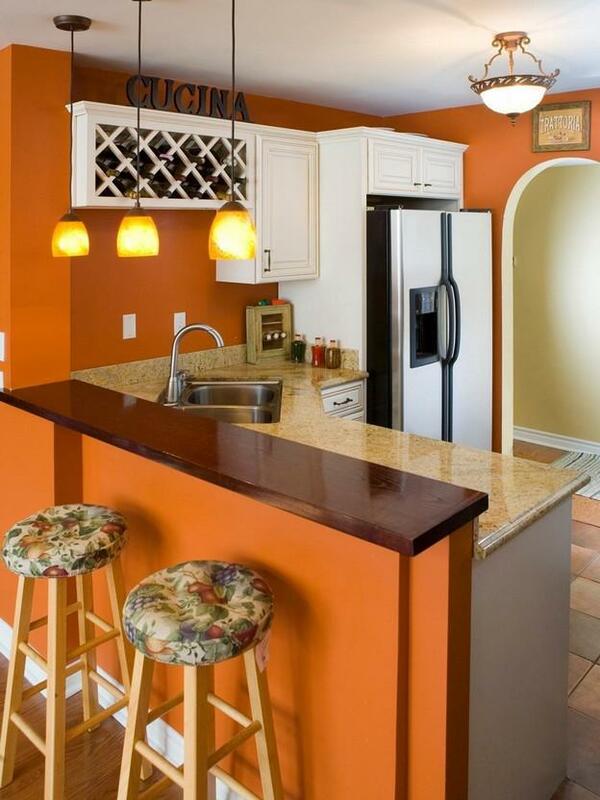 The orange color in this kitchen looks like a background because it is used for the kitchen walls. 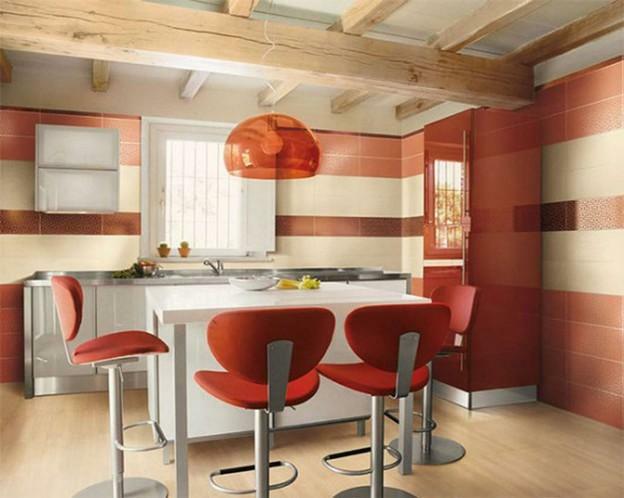 The pattern of the orange kitchen walls is a great idea to make the walls look more interesting. The neon lights are placed at the bottom of the wall-mounted kitchen cabinets that makes the orange kitchen walls look shiny so that it matches the white color that dominates the kitchen area. The dark brown bottom kitchen cabinets are added in order to balance the colors in this area. 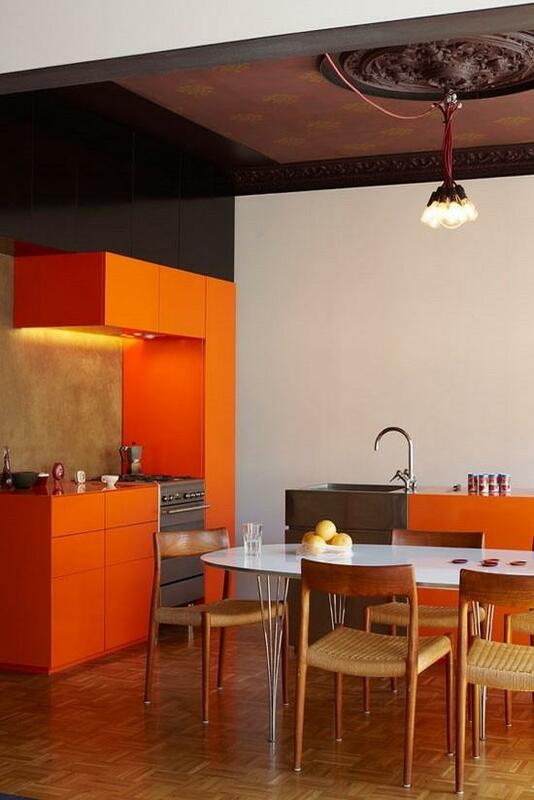 For you who want to have a minimalist yet colorful kitchen in your house, you can try this idea of an orange kitchen. The color combination of orange, brown, and white is perfect. The householders place some decorations such as the simple and classy hanging lamps, unique wall-mounted wine cellar, and decorative words in order to make the kitchen area looks very attractive. The floral patterned dining chairs are also added so that the kitchen area does not lack pattern and looks less plain. A marble countertop is chosen because it is strong and resistant to heat. 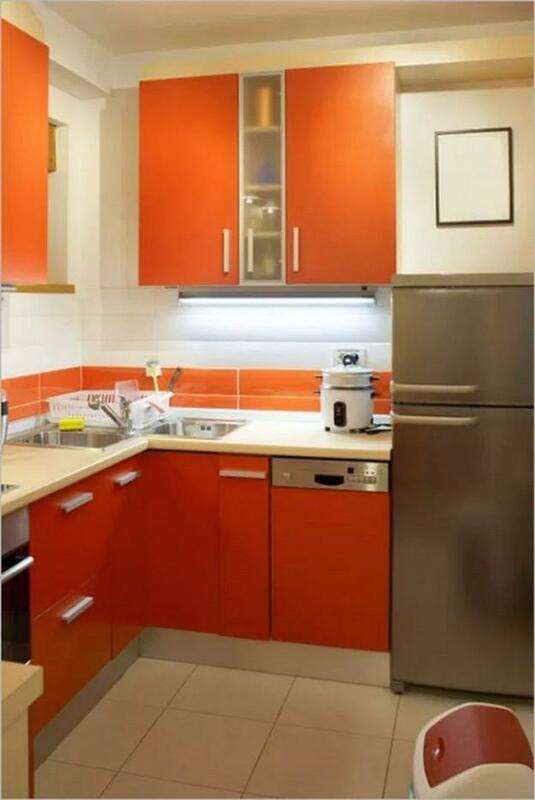 If you do not want to use the real orange color to be applied in your kitchen, you are able to choose a reddish orange just like you can see in the picture above. The reddish orange color is dominating the kitchen area because it is applied in most kitchen elements such as dining chairs, hanging lamp, fridge, and some parts of the kitchen walls. The householders balance the color by adding white. The office look dining chairs and logs in the ceiling create a unique twist to this kitchen area. The black color which is dominating this area makes it looks so mysterious. 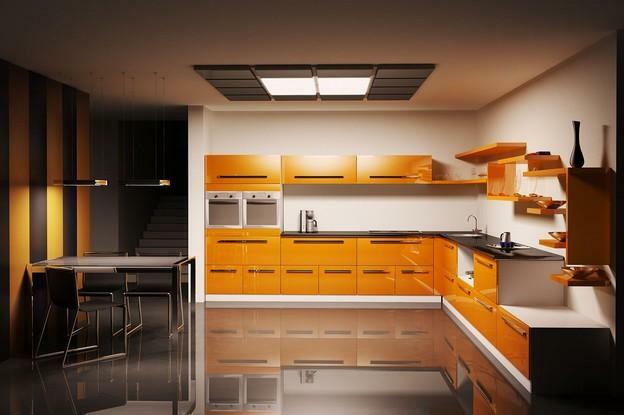 But the orange color used for all of the kitchen storages prevents the area from looking too mysterious and dark. The dining wall combines 2 colors used in this area in a stripe pattern, which is black and orange. But the kitchen walls, added by the bright lamp in the ceiling, are painted white in order to add brightness to the kitchen area. Even though this kitchen area looks mysterious, it will surely be at the center of attention in a house. This kitchen area is full of decorations. A lot of decorations are placed in the kitchen walls, hanging lamp, kitchen cabinets, and even the refrigerator. The orange color is applied in one side of the kitchen walls. 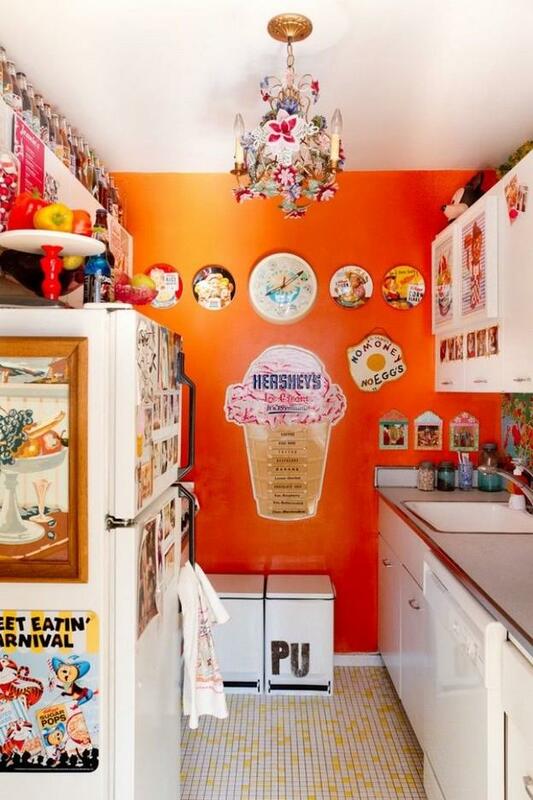 This kitchen area is small, and the decorations make it looks crowded. So that this idea might not be suitable for you who want a spacious look kitchen. But for you who want a very decorative kitchen, you may want to try this idea. If the previous kitchen area is full of decorations, this kitchen is full of colors. From orange, baby blue, dark blue, and white are combined in this kitchen area. But surprisingly, all of those colors blend perfectly. Who knows that orange matches with blue? And if you can see in details, the orange color is not only used for the kitchen walls and refrigerator, but also for the kitchen tools such as a cooking pot, spatula, plates, and even toaster. The white color is actually added in order to balance the colors in this kitchen. The orange color from the kitchen cabinets is matched prettily with the wallpapered floor and rattan dining chairs. The rattan dining chairs and pattern from the floor make this kitchen area gets a traditional look. The householders simply use some bulbs as the lighting, but the decorative ceiling is able to add an attractiveness to the area. The white dining table is chosen in order to balance the colors in this kitchen and dining area. This kitchen is dominated by white, but the orange color at the bottom of the stove, even though it is just a little, is able to add a color, saving the area from looking too plain and boring. Some decorations are placed in the kitchen walls so that this kitchen looks more decorative. And the bronze kitchen faucet brings a fancy touch. Applying orange color is able to instantly make your kitchen looks more colorful and fresh. Try it to avoid having a boring kitchen.